Unlock Your Free Wildstyle Marauder! To celebrate H1Z1's launch out of Open Beta on PS4, we wanted to say "thank you" to the 12 million+ of you who have joined us in Pleasant Valley so far with a special surprise! To get the first ever skin for the Marauder, the NEW Wildstyle Marauder, all you have to do is log in and play a match of Solos, Duos, or Fives between now and 11:59PM PDT on Sunday, August 26. This bold beauty is the perfect companion piece to the other Wildstyle items in the Battle Pass. What's your ideal Wildstyle outfit? Share it with us on Facebook, Twitter, or the new official H1Z1 forums! PC Game Update - Season 2! All PC Live servers will be coming offline at 9AM PDT on Thursday, July 26 for an estimated 4-hour update to bring you Season 2, bug fixes, the new Fumigator Collection, and more! This update marks the start of Season 2! For more details on scoring and rewards. Spawn select has been enabled in Solos, Duos, and Fives; however, the gas ring preview and player heat map have been disabled. This provides players with agency over their starting location while removing some of the predictability around where other players are spawning and where the safe zone will be. Slightly increased ATV spawns and slightly decreased police car spawns. A general consistency pass has been done on loot distribution, so that areas where there was blatanly too much (or not enough) loot have been improved. The new lighting ratios based on survey results and feedback from the Test server are: Sunny (50%), Night (20%), Dusk (15%), and Gloomy (15%). Removed the horizontal bar in the window of mobile homes. Mini-map no longer closes when the Inventory is opened. Added additional particle effects to the Apocalypse AK-47. Various anti-cheat updates and improvements. Removed collision from arrows that have been fired into objects, removing the ability to use them to climb up objects such as trees. Jumping backwards and sideways now maintains expected movement speed. Toggling mute (default: Control + M) now works when on loading screens. Tribute and Royalty Tactical Helmets no longer incorrectly cause a bleed effect when shot off. Numerous bug fixes and performance optimizations on the remastered Z1 "Outbreak" map. Individual Fumigator Collection Crates are available for 500 Crowns each in the Marketplace, and a 9-pack guaranteeing all 10 helmets is available for 3500 Crowns (saving 1000 Crowns vs. buying them individually). Starting on Friday, two NEW Rasta weapons will be available from the Message of the Day! To match the new Legendary Rasta Fumigator Mask from the Fumigator Collection, grab the Rasta AK-47 and AR-15 before these offers disappear at 11:59PM PDT on Sunday, July 29. The July 26 update for H1Z1 on PC marks the start of Season 2! Check out our recap of Season 1, see what's new for Season 2, and learn what new rewards you can earn below. Season 1 ranking was focused heavily on consistency, which ultimately led to some players achieving their "perfect top 10" and not playing any additional matches for fear of ruining their placement. It was more punishing for players just trying to have fun or improve from game to game, as it counted even "bad games" as part of consistency scoring, which could lead to de-ranking. With Season 2, we want to re-emphasize the importance of kills over consistency or even placement, so that you can climb towards to Royalty without worrying about de-ranking. Placement: Normalized the modifier to be flat (similar to Preseason scoring models), so no more fear of a bad game de-ranking you. Scoring: Increased kills as the dominant factor of rank achievement. Consistency: Removed the impact of consistency being applied to the scoring equation. This week's update to the Test server brings you our revised plans for Season 2 gameplay. We've been listening to the community feedback since our Fort Destiny Friday and Dev Digest livestreams talking about adding features like revive and the Ranch Rifle into season play, as well as adjusting player caps per mode. We appreciate the passion around keeping H1Z1 true to its roots - based on your feedback, revive and the Ranch Rifle will NOT be added for Season 2, and player caps will be remaining the same as they are currently. Please be sure to let us know your thoughts on the below Season 2 updates in the survey available from the Test server Message of the Day, and we look forward to sharing this Season's rewards with you in the near future (hint: we hear you like weapon skins!). Match scoring has been adjusted and is similar to Preseason values. Kills are more valuable than they were in Season 1. Placement and consistency modifiers have been adjusted so that bad games no longer lower your overall rank. A general consistency pass has been done on loot distribution, so that areas where there was blatantly too much (or not enough) loot have been improved. The Smoky lighting scheme has been removed. The amount of fog in the Foggy lighting scheme has been toned down (now called "Gloomy"). A Night lighting scheme has been added (included for testing purposes - let us know if you'd like to see it included in the regular rotation!). The available lighting schemes currently on Test are now: Sunny (50% chance), Gloomy (25%), Dusk (15%), and Night (10%). Additional street and parking lights have been added or adjusted at many POIs to accomodate the Night lighting scheme. Match-based ping restrictions are now applied to Solos, Duos, and Fives on the remastered Z1 "Outbreak" map. Fixed an issue where teammate's health occasionally is incorrectly shown as full despite having taken damage. Fixed two Tutorial Challenges that could not be completed. Fixed two issues that were causing rare crashes. Looking for the perfect companion pieces to your original H1Z1 Pro League team collections? New H1Z1 Pro League team packs (with Helmets and Backpacks) are now available in the in-game "Buy Crates" section of the Marketplace. Shoot for the moon with the NEW Starry Night Bundle available from the Message of the Day, which includes a matching Shotgun (animated!) and Makeshift Armor. Act fast, as this offer will only be available until 11:59PM PDT on Sunday, July 15! All PC Live servers will be coming offline at 9AM PDT on Thursday, July 5 for an estimated 4 hour downtime to bring you a NEW Arcade mode and more - check out all the details below. Found more abundantly around the map, find and collect 50 of these skulls before the end of the Hunt. However, these Wasteland Skulls are still in limited supply each match, so keep your eyes open as you scavenge for gear. Collecting 50 of these skulls (your progress carries between matches) will get you 3 Silver Victory Crates. This skull, from the very first H1Z1 winner, is far more rare - only 1 per match can be found randomly on the map. The Skull of the King is haunted, and the golden energy it emits can be both seen and heard. Locate this skull, acquire it, and WIN a match while you possess it to unlock the elusive Scavenger Skull Helmet. Scavenger Hunt will only be available in Arcade mode until Tuesday, July 10, so be sure to earn your Helmet before the Hunt ends!The Skull of the King can also be looted off others, and any lootbag with it will be clearly seen to contain it. Find it or kill for it, the goal is the same - possess it and win! For a few hours only, we're offering a special deal on 5x Apocalypse Crates for 60% off - you'll see this offer directly in the Message of the Day. Act fast though, as this deal is only available until 11:59PM PDT on Thursday, July 6! This offer can only be redeemed once per account. To cap off a star-spangled week, you can grab the Patriotic Shotgun directly from the Message of the Day between 10AM PDT on Friday, July 6 and 11:59PM PDT on Sunday, July 8. PC Game Update - Welcome to Outbreak! Today's update for H1Z1 on PC brings back Z1 favorites, features some new rewards, and introduces the brand new Apocalypse Crate! All PC Live servers will be offline starting at 8AM PDT on Wednesday, June 27 for an estimated 4-hour downtime to bring you the below. New Map: Z1 Remastered, aka "Outbreak"
Welcome (back) to Z1, now available on PC Live servers! The remastered Z1 map (also known as "Outbreak") is an 8km by 8km map. Outbreak is meant to appeal to all players of H1Z1, old and new, by capturing and maintaining what made Z1 fun while also updating and refining the map for battle royale gameplay. Veteran players may notice a few smaller POIs in the northern and western areas of the map, along with new loot spots in the otherwise sparse areas. The terrain has been refined for improved navigation and to make it clearer where you can and can't drive a vehicle. Buildings have been updated to be more performant and visually appealing. While most building layouts are unchanged, some were revised to better fit within area, window, and door metrics to make combat and navigation more consistent and less frustrating. All of this was done with an overall development philosophy to keep the footprint of the classic map and retain what made each city and POI fun and interesting. The new map Outbreak is now available for play in all regular modes - Solos, Duos, and Fives - as we are currently in an off-season until Season Two kicks off in July. Based on community feedback and survey results from the Test server, spawn selection has been disabled for Outbreak. In addition, there are multiple lighting and climate schemes for Outbreak that will randomly rotate from match to match (take a look at some examples here). Finally, as we know many of you are fans of the Z2/Arena map as well, keep an eye out for how it could reappear in Arcade mode moving forward! Spawn selection has been disabled in all Outbreak game modes. The AR-15 and AK-47 have been adjusted to allow two to three (depending on how fast you're firing) extra shots put on target before recoil growth kicks in. This does not affect tapping shot behavior. The AR-15 and AK-47 are now 60% more accurate when hip-firing. Crouch fatigue has been removed, so players are no longer restricted with the crouch action regardless of how often it is used. Jump animations have been shortened to provide a more responsive jump action, allowing players to jump more frequently without having to wait for animations to complete. Additionally, player momentum and velocity persist in the direction of the jump, allowing you to freely aim and look around without prematurely shortening your leap. Running and sprinting animations have been restored to Preseason 3 versions, with the Rifle class of weapons having a prominent forward-facing position. Much-beloved bullet impact sounds have returned. Helmet break, headshot, and laminated/makeshift armor break sounds are all back from Preseason 3. To get in the Outbreak spirit, we've got two brand new rewards we're giving away this week only - the Homecoming Scrubs Set and the Z1 Zombie Mask! You can pick up the Homecoming Scrubs Set by playing 1 match of Solos, Duos, or Fives between 12:01AM PT on Wednesday, June 27 and 11:59PM PT on Wednesday, July 4. The Z1 Zombie Mask is our way of saying "welcome back!" - if you have an H1Z1 account that was created prior to September 20, 2016 and play 1 match of Solos, Duos, or Fives between 12:01AM PT on Wednesday, June 27 and 11:59PM PT on Wednesday, July 4, this haunting helmet is yours to keep in addition to the Homecoming Scrubs Set. Both of these rewards will be granted directly to participating players towards the end of next week, after the eligibility window closes. Fight like it's your last day on earth with the items from the NEW Apocalypse Crate, available now from the in-game Marketplace! Get magical with the new Rainbow Unicorn set, stay cool with the Sun's Out items, or grab the first ever Legendary gun skin - the Apocalypse AK-47 - featuring a unique new model! Check out everything that's inside the new Apocalypse Crate here. How are you celebrating the new map? Let us know on Facebook, Twitter, or Instagram with #Z1Outbreak! PC Test Update - Z1 Remastered + More! Learn more about the test schedule, map, and gameplay changes! All Test servers will be unlocking at 10AM PDT on Thursday, June 21 with the latest update, which features Z1, movement updates, and more! Z1 will be available for play on Test in Arcade mode as a Solos ruleset from 10AM PDT on Thursday, June 21 through 10AM PDT on Monday, June 25. It will be unlocked for play in all Test regions 24/7, and Combat Training will also be unlocked for the duration to let you test out the latest combat mechanics. In addition, spawn select will be turned ON for Z1 in Arcade mode on Thursday and Friday, and will be turned OFF for testing on Saturday and Sunday. Be sure to keep an eye out for the survey in the Message of the Day to let us know your feedback on all things Z1! Welcome (back) to Z1, available for play on the H1Z1 Test server! Z1 is an 8km by 8km map that is meant to appeal to all players of H1Z1, old and new, by capturing and maintaining what made Z1 fun while also updating and refining the map for battle royale gameplay. Veteran players may notice a few smaller POIs in the North and West areas of the map, along with new loot spots in the otherwise sparse areas. Terrain has been refined for improved navigation and to make it clearer where you can and cannot drive. Buildings have been updated to be more performant and visually appealing. While most building layouts are unchanged, some were revised to better fit within area, window, and door metrics to make combat and navigation more consistent and less frustrating. All of this was done with an overall development philosophy to keep the footprint of the classic map and retain what made each city and POI fun and interesting. We've also included four unique lighting schemes that go along with a new system that randomly selects one each match. The current plan is to keep a rotation of different lighting and climate setups that may occasionally change. Please let us know what you think of the ones on Test! A lot of time, effort, and love have gone into remastering Z1. Our team is really excited to share this with you, and we look forward to your feedback! AR-15 and AK-47 have been adjusted to allow two to three (depending on how fast you're firing) extra shots put on target before recoil growth kicks in. This does not affect tapping shot behavior. AR-15 and AK-47 are now 60% more accurate when hip-firing. Running and sprint animations have been restored to Preseason 3 versions, with the Rifle class of weapons having a prominent forward-facing position. Bringing the end of Season One, weapon lock, and more! Season One has now ended, and the off-season has begun. Season leaderboards and Top 10 scores will be locked, and matches will not be ranked during the off-season. Season Two is slated to kick off in July - stay tuned for more details on scoring changes as we get closer to the end of the off-season. The reward grant for Season One will happen later this week, as we're confirming that players will be granted their items based on highest tier achieved. While in Solos, Duos, and Fives matches, weapons will be locked for players whose ping or packet loss exceeds acceptable thresholds. This does not impact Arcade mode, Combat Training, or Hosted Games. In regions where 150ms is the ping restriction, weapons will lock at 187ms. In regions where 200ms is the ping restriction, weapons will lock at 248ms. When spectating teammates, you can now open the map and are shown the gas timer and information. When the gas ring is showing in Spawn Selection in Fort Destiny, it will also show as soon as the game begins. Preparation for this weekend's Arcade mode ruleset, Bullseye (featuring scoped weapons only). From starting the H1Z1 Pro League to exiting Early Access, releasing Auto Royale to launching Open Beta on the PS4, we’ve accomplished a lot together this past year! As we head into the second half of the year, we wanted to take some time to update you on our plans for the summer. We've heard and have been paying close attention to the amazing amount of community feedback around H1Z1, and we're excited to build the future together with you! Let’s start with one of the most anticipated updates: Z1. We know that Z1 has been top of mind for many of you this year. We’ve shared some of the progress to date, and can confirm that its release is just around the corner. As we put on the finishing touches, we have been working with a handful of long-time players and community members to make sure we have recaptured what made the original Z1 so great. From where the camp south of Cranberry sits to rooftop coverage in Pleasant Valley, we have been making adjustments to ensure that the map feels right and provides enough terrain variety to create some intense fights. We plan to release the map during the off-season between Seasons One and Two so that you have time to play and share feedback in a non-competitive environment - stay tuned for more news on its official launch date! Z1 isn’t the only thing coming back either - we heard the community desire to recapture some of the best gameplay components from previous Seasons that made H1Z1 unique, and have begun reevaluating movement and animation as well as audio. We are working on a faster and more responsive movement and action system for your character that keeps things fun and easy-to-use for new players, while continuing to provide opportunities for expert players to develop more advanced forms of movement and skill. The two key components of movement and animation that we are looking to recapture the feeling of are jumping and sprinting. You also shared that you enjoyed some of the old sounds (we did too), so we are looking to bring back the classic headshot and helmet break sounds! Some of you may have already seen the announcement that Season One will be ending on next Wednesday, June 6, with an off-season to follow before Season Two kicks off in July. As mentioned above, part of this timing revolves around when we hope to release Z1, so that you can help us test and provide feedback on a larger scale in an unranked, non-competitive setting. Also, if you’re hoping to make that last push for Royalty, here’s a look at the rewards waiting for you at the end of Season One. In addition, we will be making some scoring adjustments for Season Two during the off-season based directly on community feedback, such as emphasizing average kills more than average placement. We will also be looking to reduce the effectiveness of cars as a late game option prior to Season Two, and there are a few different options here (such as having vehicles spawn with a variable amount of gasoline or increasing the gas/boost consumption rate) that we’re excited to have you help us test out. Finally, we wanted to share a quick update on Auto Royale. We had a lot of fun designing and playing Auto Royale, and we know many of you have fun playing too! There’s just something about driving around in cars and blowing stuff up that’s relaxing and gives a nice break from the intensity of the core game. There are even more crazy twists we can add to the gameplay to amp up the fun, and because we want to keep tweaking it, we are going to be moving Auto Royale over to Arcade mode as a rotating ruleset. This move helps to separate casual and competitive play, and also allows us to add awesome weekend rewards! Starting this Friday, June 1, Auto Royale will be part of the rotating game modes available in Arcade mode. We want to say a huge THANK YOU to you, the community, for sharing your passion around what makes H1Z1 unique! We're listening, and we're excited for you to get your hands on Z1 as we all work together to recapture those fun, fresh, and exciting elements, all while staying true to the pure battle royale spirit that is H1Z1. We’ll see you in the pit! In order to maintain a fair and consistent gameplay experience in our competitive modes, connection quality restrictions now apply to all ranked matches. Players with a connection quality that fails to meet ping threshold requirements will be unable to join ranked matches (Solos, Duos, and Fives), even if they are able to connect to that region. For reference, ping requirements are 150ms for North America, South America, and Europe, and 200ms for Asia/Pacific and Australia. All players can still join Arcade and Hosted Games, as well as Combat Training. Pressing the "Escape" key now cancels channeled abilities (e.g. using a first aid kit). Report Player functionality is now available on the match end screens. Map borders no longer appear incorrectly in some resolutions. Exit button now always appears correctly in the UI when spectating a teammate as the game ends. What is up everyone! The H1Z1 team has been working hard and we're excited to share some details about today's major update. If you're looking for even more details, please take a look at the full patch notes for this update. This update casts a wide net in terms of what it touches, so without further delay, let's get right into it. Let's lead off with one of the most important features of this update: performance improvements. The Core Tech team has been extremely busy diving deep into how the engine runs and they discovered quite a few issues when it came to multi-threaded vertex buffering. So, what does that mean? In short, there were a lot of places in H1Z1 where a process that could be handled by multiple threads would essentially get stuck, which would result in a stutter. The Core Tech team would like to extend their thanks to the community for continually providing examples of micro stutters and performance issues. Those examples gave us an extremely solid starting point to begin our investigations, and they help expedite the process of finding proper solutions. Please keep those examples coming as we will be continuing our endless pursuit to make H1Z1 perform as best as it can. As many of you know, the H1Z1 Pro League is starting extremely soon with their inaugural match at 7PM PT on Saturday, April 21 - all live from Caesars Palace in Las Vegas. With the addition of the Pro League, we wanted to show support on our end with some special and extremely attractive team skins. On top of these skins looking fresh, a portion of the proceeds will go right to the Pro League AND to the teams equally. Check out some of these amazing items below! To reiterate, these are some of the highlights so check out the full patch notes if you'd like more details on the specifics! As always, the H1Z1 team is endlessly grateful to have such an interactive community. We've been building the game together for years, and we're looking forward to continuing this tradition with you. As with any patch, there's always more to follow - we appreciate your insight, and we'll need your feedback to make sure we get it right. Servers will be coming offline on Thursday, April 12th at 2:00pm Pacific Time and will remain down for approximately 6 hours. This patch focuses primarily on optimization for micro stutters, bug fixes, and more. Optimized how the GPU handles shotgun particle effects. Optimized collision detection by multi-threading scenarios that were only running on a single thread. Optimized threading line-of-sight and shoulder swap collision checks. Optimized how information is sent to the Kill Feed that reduces load on the UI. Optimized how SpeedTree handled vertex buffer multi-threading. Optimized how the game engine handles scenarios where numerous players are fighting in a particular area; most frequently found in Fives. Fixed a specific micro stutter case that could occur by optimizing how irradiance volumes are created and handled. Fixed a specific micro stutter case that could occur when aiming down sights. Crouch fatigue exists to prevent crouch spamming, however there were circumstances where it was a bit too punishing. Crouch transitions should feel smoother now and you're allowed a bit more movement before the fatigue kicks in. Spawn Selection window now opens by default and the gas ring preview is always enabled. To combat the "head glitch" issue, we made firing over objects more restrictive requiring more of your upper body to be exposed before you can fire over objects. The most notorious of these was the light bar on top of cop cars. Now that we've moved the light bar to be inside the cab, we can relax this requirement a bit and allow you to shoot over objects easier. As always, we'll continue to monitor this and make improvements as necessary. Vehicles are now more evenly distributed throughout The Arena regardless of the safe zone's starting location. Shotgun hit feedback has been updated so that if any pellets are headshots, the Kill Feed and Death Screens will properly give it credit as a headshot. Frag grenades have had their one-shot radius reduced by 50%. Molotovs have had an 80% reduction of up-front damage to decrease their lethality and make them a displacement weapon. All lethal grenades have had their cooldowns increased from 5 seconds to 7.5 seconds. Stun grenades have been renamed to flashbangs to more clearly indicate their effects. Flashbangs and smoke grenades have had their cooldowns decreased from 5 seconds to 3 seconds. Smoke grenades no longer respect the global grenade cooldown and can be thrown immediately after other grenades. H1Z1 has unique combat that can be difficult to master. We introduced the Combat Zone largely as a tool to help players learn and master the various weapons. We've renamed it Combat Training, and made a few updates to enhance the overall experience. Players now always spawn with an AR-15, AK-47, and Shotgun in their weapon slots, and an SMG in their Inventory. Increased Inventory capacity to allow for easier weapon swaps. Respawning players are now hidden and protected from damage until they've fully loaded in. This should reduce the frequency of "spawn kills." Reduced size of mini-map player icon. Made teammate death state and kill count more identifiable. Kill Feed is slightly more prominent and now stays active on the end screens. Added the Level 100 reward (for reaching Level 100 prior to Early Access Launch and the account level wipe). Several additional anti-cheat improvements and optimizations are in this build. Adjusted how ammunition is distributed to players. When you reload, another magazine will be moved from the vehicle to your inventory. This ensures that you can always reload and no longer need to split ammo with your teammates and drag it into your inventory. We also removed the ability to take ammo directly from the vehicle inventory, since it is no longer necessary, which will prevent teammates from taking all the ammo for a particular weapon. ARVs now start with 6 land mines and 2 smoke screens. Sedans now start with 1 oil slick and 3 smoke screens. Repair Kits and Combat Repair Kits are now instant-use (they still heal over time). High-Octane Turbo can now be used when the vehicle is airborne, allowing for some pretty interesting new behaviors. Try it out! Rocket Launcher has been tuned and polished. Recoil has been significantly reduced and rockets do more damage to players inside a vehicle that is directly hit, and will knock off their helmets. Rockets that directly hit players will now also accurately damage vehicles. Land mines can now be destroyed with a single shot. Removed or adjusted numerous objects on which vehicles could get stuck. Vehicle Horn is no longer bound by default to Mouse 3. Players are now properly removed from vehicles after disconnecting. Trees will no longer pop in and out when playing on max render distance. Players now get proper kill credit when an opponent they've recently damaged is killed by bombs, gas, or falling damage. Kill Feed also now shows the proper icons for these scenarios, as well as deaths from nearby explosive barrels. Empty airdrop crates will no longer incorrectly spawn at the center of the map. Falling off objects should no longer feel different regardless of Reduce Input Lag setting. Players no longer float when prone-rolling off a building. AK-47 switch fire rate UI no longer remains off screen after switching to other weapons. A team member's dot on the compass should always have its correct color. Stay in Group UI no longer overlaps with other HUD elements. Rebinding "F" to any key no longer prompts user that another binding will be cleared when it is not currently bound. Vehicle upgrades are now always properly applied in Auto Royale. LG-IG ammo is no longer incorrectly increased by one when moving the weapon to the trunk. Players who wind up solo-queued into an Auto Royale match will no longer get booted to the desktop and will instead be sent to the main menu. Fixed numerous clipping or floating objects in Auto Royale. Occasionally, players may be unable to switch to certain seats in a vehicle. Weapons may appear to animate vertically when crouching and shooting, more frequently when up against objects. This does not affect shot accuracy (visual issue only). Test Server Update & Smash - Micro Stutters and More! Play 5 Solos or Fives matches on any region during the Test Server Smash this weekend and receive 2 unlocked Bronze Mayhem Crates on the Live server. Win 1 Solos or Fives match on any region during the Test Server Smash this weekend and receive 1 unlocked Silver Mayhem Crate on the Live server. You can only earn the above rewards once, and all rewards will be granted after the weekend ends. Combat Training (formerly known as Combat Zone) will also be open at the times and regions listed above for those that would prefer to test the new update that way. Read on below for the full patch notes, and be sure to fill out the in-game survey once you've played as well! Today's patch brings a brand new weapon just to Auto Royale - the guided rocket launcher (LG-IR)! We're also introducing a new Auto Royale Duos mode. The game will be coming down for an update at 8PM PT for an estimated 4 hours. There was some logic behind the scenes that would allow players to get into games that were close to starting which caused numerous issues including those players parachuting in before others and then encountering bugs such as the inability to shoot or interact with objects in the world. This scenario should no longer occur and players will instead be put into the next available lobby. Mouse cursor will no longer occasionally get stuck on screen after opening and closing UI elements such as the map. Fixed a bug that caused Hosts' games per week allowance to not properly reset. Black and Gray Jacket can now be skinned normally. As mentioned above, Auto Royale is now available as a Duos mode as well! Hop in with a friend (or stranger), decide who's driving, and get into the action. Weapon damage and loot distribution have been rebalanced for only having one shooter per vehicle instead of three. Weapons do more damage to other vehicles and loot crates. Players can equip more than one heavy weapon (e.g. Crossbow, LMG). Weapon pickups supply one weapon and half the ammo. Added a guided rocket launcher (LG-IR) that can be found in the Rare (Purple) and Ultra-Rare (Gold) pickups. Rockets can be guided while in flight by aiming down sights, firing the weapon, and then moving your reticle (stay ADS to continue guiding the rocket). Rockets do high explosive damage and cause disruptions similar to land mines. The weapon has a long reload time and spawns with just five rockets - use them wisely! Removed numerous small objects from the world that vehicles could get stuck on or have a hard time navigating through. Also removed the sapling trees that would stop vehicles. Skill jump pickups now appear with a Star icon (instead of a weapon or supply icon) and give both weapon and supply loot in a single pickup. Decreased arming time of land mines from 2 seconds to 0.75 seconds. Decreased crossbow damage by 15%. Sniper rifle damage against players significantly increased (vehicle damage unchanged). Bodyshots now 2-shot incapacitate passengers leaning out of the vehicle and 3-shot incapacitate passengers inside the vehicle. Helmets and body armor now provide less protection against sniper shots (but still offer a level of protection). Added an Event Challenge through 10AM PT on Monday, March 26 - complete three games of Auto Royale and you'll receive the Red ARV skin! When in Auto Royale Duos, using Ctrl + Number to switch seats will also use the corresponding item in your hotbar. While this isn't an issue for weapons, consumable items (such as oil slicks, landmines, and springs) will be used when doing this if they are on the corresponding spot. Skull Store retirement, Shotties & Snipers, animating the Participant AR, and more! Live servers will be coming down at 8PM PT tonight for an update that includes Shotties & Snipers for the weekend, the retirement of some classic Skull Store items, the animated update to the 2018 Showdown Participant AR, and some additional fixes. The downtime should be approximately 3 hours - full patch notes below! Brightened non-drivable vehicles and several warehouses in The Arena in order to help with visibility and target acquisition. Players are no longer able to switch seats in Auto Royale until all teammates have loaded in. This prevents a few bugs that occurred as a result of this behavior. Royalty icons are no longer incorrectly shown in the UI after playing ten games of Auto Royale. North America no longer takes longer to load into Region Select than other regions. Fixed several UI bugs in the spectate camera and versus panel for Hosted Games. Added the Shotties & Snipers event for the weekend. No longer auto-opening the Spawn Selection panel when entering the box. This should help resolve the stuck cursor issue. 2018 Showdown Participant AR Skin is now animated. Today marks a momentous milestone for the team, our players, and the game -- H1Z1 has officially launched out of Early Access! H1Z1 has come a long way since we first released it three years ago. It was a unique project at Daybreak, which started with a small group of developers who were given a mission to “make something fun”. Over time, that mission evolved into one of Steam’s best-selling titles of 2017 and put Battle Royale games on the map. H1Z1 is the fast-paced, competitive battle royale game it is today because of you, our players. And, with 3 Invitationals, 3 Showdowns, 2 Elite Series stops, 1 nationally broadcasted tournament, and a Pro League, you all have also helped to establish a new esports genre. So, what does launching out of Early Access really mean? The core game has reached a place that we’re really happy with – it’s stable, the combat feels good, and this update includes the final pieces of the puzzle for our version of battle royale. However, launching out of Early Access doesn’t mean that development stops. Far from it. H1Z1 has a bright future ahead and we’ll continue refining the game and adding new features to bring you the best H1Z1 experience possible. More about the future later. Let’s get down to what today brings! First, a BRAND NEW GAME MODE! This was one hard secret to keep, but we are excited to bring you Auto Royale™, a new team-based, vehicular battle royale game mode. We’ve seen how entertaining driving around can be in H1Z1, so we decided to run with the idea and have a little fun. In Auto Royale, we lock you and your teammates into a vehicle, launch you into the map with up to 29 other teams and watch the mayhem unfold. During development, the team had a lot of fun adding new elements to the game specific to Auto Royale that help fuel the vehicular chaos, including the new ARV military-style vehicle, a light machine gun, landmines, corrosive gas, jumps (double jump! ), ramps, oil slicks and so much more. Auto Royale is now available in beta and we can’t wait for you to try it out. More details about Auto Royale here too! Second, we’ve added a ton a new features and polish to the core game, including a scoring overhaul that rewards consistency, Tactical Deployment, visibility updates, and more. No more Preseasons! Today is the beginning of Season 1 and with it an all-new scoring system that rewards consistency, which even includes the potential for de-rank. Don’t worry though, because while a handful of below-average games may bring down the overall ranking, it will never remove a player from the highest level of placement rewards achieved. This is intended to allow players to play how they wish in order to rank up, and always know how far away they are from the next tier. The goal was to make our current system more friendly and intuitive for all playstyles, not just the need for a 15-bomb in order to rank up. Your core Top 10 games will still carry a heavy amount of weight, but we’ve added a few modifiers specifically around average placement and average kills. This will let current players to keep playing the way they have, but also allow those players that place well but rarely get more than a few kills a game to still rank up and improve (or vice versa). Another feature that many of you have helped us test is Tactical Deployment, the ability to select which sector you will parachute into at the start of the map. Each individual zone can be selected while waiting in Fort Destiny, and a supporting heatmap will pop up indicating where other players have selected to spawn. Whether you want to drop with the masses, or pick a quiet corner like the Dam, that option is now yours. In team games, the team leader will select the general spawn quadrant. If no selection is made, a player (or team) will be dropped randomly somewhere near the safe zone. We’ve also overhauled the in-game UI to match the style of the rest of the game and make things easier for everyone. Some of the larger additions are a mini-map in the lower right corner (turn it off or switch corners if you wish), a more organized settings menu for adjusting on the fly, and an easier to use inventory menu. These updates should allow all players to understand their current situation and settings much quicker at a glance, and we wanted to ensure that the new design maintains the muscle memory acquired through thousands of hours of playtime. Playing H1Z1 just got even more rewarding - you can now earn the NEW Victory Crate for winning and Skull rewards for placing well in different match types! Click the image above to see how you can earn exclusive new skins through gameplay, leveling up, and the Skull Store. Development doesn’t stop at launch. Still to come this year is the release of Z1 Remastered and much more. Of course, our team is always working on keeping the game fair, banning cheaters as we find them and updating our anti-cheat tools so everyone can enjoy their game. Fair play is an important aspect of the game, and that focus will also never stop. Our work on overall optimization, which includes FPS improvements, remains a top priority as well. We’ve adjusted how trees appear in the world (leading to more FPS), and also set an alternative time of day to provide better colorization and visibility of other players. The effort for higher FPS will continue with each update as we move forward. Again, we want to thank you, our fans and players across the globe who have been with us from the beginning and for continuing to play the game over the years, seeing us through even the bumpy roads along the way. 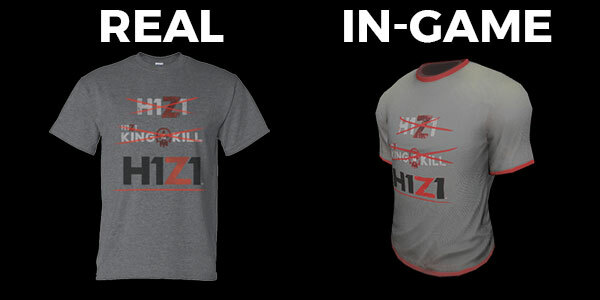 To show our appreciation, we will be giving away these exclusive “H1Z1 Evolution” shirts on our Twitter page, with details to follow. You’ll also get one in-game to show off. It's all been leading up to this. Starting with Preseason One, we set out to make H1Z1 as competitive and rewarding as possible. We added Team Scoring for Duos and Fives to continue that trend. With each Preseason we shook up the point values and Tier distribution numbers and made future decisions based on previous Preseason data. We gave out rewards for end of season placement and players were fully sporting their accomplishments in-game. Now that we're leaving Early Access, it's time to put Preseasons behind us and get started on the culmination of all that work: Season One! Season One comes with a new way of evaluating overall player performance. During the Preseasons, Royalty was solely achieved by a player's ability to get high kill games and nothing else. This lead to player behavior of jumping into a match, getting as many kills and possible and not caring about anything else. The new scoring system starting in Season One rewards players who can get kills AND place well consistently. We find that the skill to accomplish both a high kill and high placement game is really what separates the top players from the rest. The formula we're using to generate your overall score comes from taking your 10 best matches as a base, and then we apply a modifier to it based on your average kills per match and average match placement for the season. The important thing to note here is that if you perform poorly over and over again, you can find yourself sinking into a lower Tier. Along with this new system comes a new reward structure in the form of the Victory Crate - you can read all about that right here. We want to thank all the players that joined us on the ride through Early Access and the various Preseasons. The feedback and data you were able to provide during that time was invaluable. And now, without any further ado…welcome to Season One! Win a Match, Get Rewarded! Earn the new Victory Crate for winning and Skull rewards for placement! Playing H1Z1 just got even more rewarding - you can now earn the NEW Victory Crate for winning and Skull rewards for placing well in different match types! Read on below to see how you can earn exclusive new skins through gameplay, leveling up, and the Skull Store. All Victory Crates come already unlocked and ready to open! As mentioned, while you can’t trade or market the items out of the Victory Crate, you will be able to scrap them for the usual amounts based on their rarity level. The items in the Victory Crate may change over time (did somebody say animated weapons? ), so keep an eye out as we make additional announcements. What did you score out of your first Victory Crate? Let us know on Facebook or Twitter! Game Update - Auto Royale, Season One, Match Rewards & More! The time has come for our next major update to hit our Live servers and what’s an update without all the good details provided by patch notes. We’ve got a bunch of information below but keep an eye out for our Producers Letter that will have even more insight, information, and maybe even something special. We’ll also be releasing more information soon on our next crate, the Mayhem Crate, so keep an eye out for that too. We would like to take a quick moment and thank everyone, once again, for all of the feedback provided by the community while this build was on the Test Server. Working with you all to make sure we hit the key beats of every update has become a way of life for us on the H1Z1 team and we’re looking forward to continuing this with you in the future. Players can now select the quadrant of the map they’d like to spawn in while in Fort Destiny. Want to get right into the action? Spawn in Pleasant Valley. Want to take your time to loot up in peace? Try out the Dam! The spawn select map will show the first gas ring in some matches but not for other matches. The reason behind showing the ring sometimes and not others is to gather data and educate ourselves on player behavior so we can make more informed decisions in the future. A heat map shows the density of other players spawn selections in each grid. In team games the team leader will select the spawn point for the team and team mates will be notified which quadrant was selected. If a user does not select a quadrant one will be selected by default that is somewhere near the safe zone. Act fast! Spawn Selection will be disabled for the last ten seconds before the match begins. A users top 10 games will give them their base score. A users average placement will then have a modifier value that is applied to the top 10 score. A users average kills per match will then have a modifier value that is applied to the top 10 score. Once the modifiers have been applied a user will be given their ranking. This new system will challenge the player to play more conservative and be more consistent in their play but will still require them to see kills just not as aggressively as the current live scoring model. In the new system, players can de-rank, however rewards will be earned based on the highest rank achieved for a season. Based on feedback we’ve received since our last update, we’ve fine-tuned some of the most used weapons in the game to make them feel a bit smoother, however none of these changes will impact timing or muscle memory. Reset timing for tap shooting has been preserved. Reset delay has been slightly reduced. Recoil acceleration rate has been slightly adjusted. The end result is similar reset time that feels much “smoother” and less “clunky” and was made in response to community feedback. Recoil growth was reduced in order to allow the weapon to be slightly sprayable at close range. Semi Auto fire mode recoil growth was increased slightly. Full Auto fire mode recoil growth was reduced slightly so sprayability is in line with the AR-15. Damage fall off distance has been slightly reduced. Headshot multiplier has been slightly reduced. Both of these changes were made to reduce the effective range of the shotgun while still keeping it potent in close quarters combat. Breaking a helmet no longer causes a bleed, only the intended damage. Breaking armor no longer causes bleed or damage as the armor soaks up the shot completely. The sniper rifle and shotgun are the only exceptions to this rule. Gas grenades have had their area of effect reduced back to their intended size. Bandages now heal for 3HP up front and then an additional 10HP over time. Medkits now heal for 8HP up from and an additional 60HP over time. Crouch has been reworked to be more responsive when going both up and down. The crouch fatigue system has been adjusted and is more relaxed to allow more movement. Couch fatigue no longer penalizes movement and it no longer locks you from being able to stand. It’s been far too long that players haven’t been rewarded for just playing H1Z1 and it’s time for that to change. With this update we’re reintroducing Match Rewards back into the game. Winning a match of Solos, Duos, or Fives will reward 1 Victory Crate. Skull Boosts are applied to Match Rewards. The Victory Crate contains over 75 brand new skins that are untradeable and unmarketable, but scrap for the same amount as skins from paid crates of equal rarity. Winning isn’t the only way for you to get your hands on some of these new skins, you can opt to do a bit of grinding and you can buy them from the Skull Store for 7,500 Skulls each. You can also earn 2 Victory Crates by completing the Tutorial Challenges if you wish. We’ve taken a pass on the Account Leveling system as it needed some love. The old system gave a crate every 5 levels and the process didn’t feel as rewarding as it could have. The experience curve for Account Leveling has been reworked. New users will receive a basic set of skins when leveling from 1-10. Existing users already have these skins. After you reach Level 10, you will be awarded Victory Crates for leveling. Existing users accounts have had their level reset. If you were at Level 100 you will receive a special item in the next few weeks. Experience gained from matches has been normalized as the drop off in experience gained isn’t as significant until you reach 75th place and below. We’ve seen a ton of feedback around visibility and lighting in the Arena so we’ve made some adjustments to help increase visibility at all ranges. Lighting settings have been adjusted to make shadows not render as dark. Fog has been removed at distances up to 350 meters. Colors have been adjusted to be slightly more vibrant/saturated. Flora has been adjusted for all GFX settings and reduced in general. SpeedTree has been updated to version 7. This helped visibility against trees and is slightly more performant. Gradient map values have been updated to reduce bloom on certain types of floors and walls. In-game user interface has been updated to be much cleaner and require less screen area. Added a Mini-Map on the bottom-right corner of the screen. There are options to show or hide it, as well as the ability to pick a couple locations of where it is located on screen. You can now move normally with the map open, similar to having the Inventory open. Drop shots have been added back into the game. You can sprint strafe while prone in order to roll and shoot. Footstep sound effects have received another tuning pass so that they are lower volume generally but still loud enough to make sure you can hear enemies coming. Magnum is no longer a starting weapon in Combat Zone. Players now start with Combat Super Serums in Combat Zone, which fully heals the player after use. The airdrop bomber has been updated and replaced with a jet. This was done so the bomber has unique audio in an effort to increase player feedback and clarity. Bombs will no longer drop passed the 3rd gas phase regardless or when there are only 20 people remaining, whichever comes first. Updated the split-stack UI element for ease of use. Keystrokes now immediately input to the numerical field (no longer have to click first). Number keys (keypad and keyboard), backspace, delete are all accepted, and left and right arrow keys will move the cursor. Clicking off or pressing escape closes the pop-up. Settings menus have been restructured and re-ordered to make more sense. Settings are ordered by usage and importance and are generally grouped with similar options. Added options for Team Voice Chat and Proximity Voice Chat. Added headphone and panning options to the audio menu. Mute Fort Destiny Proximity Voice option updated so that off means off. Changed default Interact key to “E” (was “F”). Running over other players with a vehicle now shows the vehicle and skin used in the Kill Feed. The Hosted Games Spectate HUD is being updated to reflect the new in-game HUD. Default look, scoped, and aiming mouse sensitivity is now set to 10%. Removed the glare from vehicle windows and windshields. Vehicles no longer lose turbo or torque until the condition is less than 20%. The final phase of the gas rings will now shrink to 1 meter. Multiple optimizations that fix issues related to framerate drops and overall performance. Fixed numerous areas with inappropriate loot distribution, such as the supermarket in Pleasant Valley. Missed shots will no longer occasionally register as hits with blood spurts, despite it actually being a miss and the player taking no damage. Tree Quality and Flora Quality settings now correctly set the quality level in-game and persist when restarting the game client. Other players no longer occasionally appear on the wrong side of a tree when playing on low settings. Falling off objects now behaves the same with Reduce Input Lag enabled or disabled. Vehicle skins now show for all players regardless of distance between players when the skin was applied. Recoil no longer resets below its expected position after firing while aiming high while prone. First person camera angle now resets properly after releasing the free-look key while running. Vehicles take more consistent damage over time when flipped, regardless of whether they are flipped onto the hood or roof. Adjusted player animations when using a crossbow to keep the elbows more tucked in similar to other weapons. Players can no longer shoot through ceilings that can be reached by jumping and shooting. Sniper Rifle Scope now properly covers the whole screen when using an ultra-wide monitor or resolution. Clicking on a throwable now properly equips it in your throwable slot, even if you already had one equipped. Fixed SMG animation when crouched and aiming down sights while in first person mode. The size of thrown weapons (grenades, etc.) is no longer larger than intended. Map now scales properly when switching screen resolutions. Speedometer needle no longer overturns when driving at high speeds downhill. POI icons no longer overlap text in the compass. Campers are no longer clipping into each other in D10. Players can no longer see through the world in a particular barn area in I2. Fixed a few floating items near Dragan Lake. Certain skins no longer prevent kills from counting towards Hellfire SMG challenges. End screens now always show completed challenges. When the group leader cancels a queue, it is now canceled for all group members. Viewing another player’s Top 10 no longer shows a blank Top 10 of your own. Added a prompt warning the user when they are scrapping an ultra-rare vehicle skin. Rapidly scrapping skins no longer bypasses the confirmation when scrapping the last skin. Sniper Rifle no longer has an incorrectly colored dot on the back of the weapon. Eyepatches no longer clip through characters heads. You will no longer play the “on-fire” animation after the fire has been extinguished from a smoke grenade. Fixed numerous minor clipping and text truncation bugs in the User Interface. The end screen user interface occasionally does not show up or cannot be interacted with, forcing the player to either wait for the match to end or restart the client. This happens most frequently in team modes when dying without another player killing you (e.g. Toxic Gas). Placing map markers may lower framerate. In Auto Royale, the vehicle HUD occasionally goes missing. Opening and closing the Inventory brings it back. In Auto Royale, characters can appear to be stuck aiming down sights. This is caused by switching seats while aiming down sights and can be fixed by switching seats again. Average Placement and Average Kills are not represented in the score progress bar or in the player's score on the Season 1 Top 10 Matches Score Screen. Match Rewards often show the wrong icon. Test Server Update - Color Tests, Solo Win Rewards, and more! Win a Silver Zodiac Crate on Test! Win a Solo match on Test and earn a Silver Zodiac Crate! Over the next three days, Wednesday, Thursday, and Friday (2/21 – 2/23) we’ll be rewarding players who get first place wins from Solo matches on the Test Server. The reward won’t be automatically granted upon the completion of the match but will be granted to your Live account within a week. We’re looking for data to help us tune the new scoring system so please play how you would normally play on the Live Servers. Make sure you tune in for the Royalty Showdown for more information on scoring changes coming in the next season. Over the next three days, we’ll also be trying out different times of day for color and visibility tweaks. We’ll be adjusting saturation and vibrancy levels on our end so when reviewing the differences between the days, remove any digital vibrancy you’ve additionally added via NVIDIA tools and turn shadows back on if you have them disabled. Please take some time to jump in-game, play a match and then provide your feedback via the in-game survey. We’re ultimately looking at improving player visibility to enhance the current gameplay. Added a 10 second spawn selection lockout before the match begins. Removed Magnum as a starting weapon in Combat Zone. Added a new item called Super Serum that will heal players to full health instantly (after the cast). This is only available in the Combat Zone. Added animation to exiting the ATV at moderate to high speed. Fixed another issue that could cause framerate stutters. We will continue to investigate and implement improvements in this area. Players once again parachute from the intended altitude. Players should no longer appear partially below the ground in Fort Destiny. Cleaned up the first person vehicle exit roll animation. Fixed player animation when sitting in the back of a pickup truck. Players no longer incorrectly walk when standing from prone after aiming down sights with a throwable. Fixed backpacks appearing distorted or folded when equipped by a player. Play Again and Next buttons should no longer occasionally be missing after dying in Solos. Removed spinning image over the H1Z1 logo in the main menu. Red dotted line to the safe zone now appears underneath the player icon in the mini-map. “Stay in Group” UI elements no longer clip over other HUD elements. Fixed a few crashes that were occurring on the previous Test build. We’re excited for this build to land on the Test Server today as it’s packed with some pretty awesome features and much-needed fixes. As we mentioned on the Community Outbreak yesterday this build is coming in pretty hot, so bear with us as we continue to work on and polish it. As always, feedback is going to be key in making this a successful update, so please let us know what you do like and what you don’t so we can work on this together to make sure this patch is as solid as possible. Bandages now heal for 2HP up front and then an additional 8HP over time. Medkits now heal for 8HP up from and an additional 52HP over time. Some of the end-screen windows overlap with each other. The camera for high-speed vehicle exit is not final. Backpack animations can get into a state where they move or fold incorrectly on the player. There are several instances of placeholder art in the Main Menu. In preparation for the Royalty Showdown. This game update brings a handful of bug fixes as well as data required for the upcoming Royalty Showdown. Players can no longer shoot over the police car light bar and most of the roof as well as over objects of questionable heights like certain hay bales, semi-truck cabs, dumpsters, half walls, etc. Improved the anti-cheat detection for players who are teaming. Fixed an issue that could cause other players who are aiming down sights to appear to be running in place. Added some debug information to the death and victory screens to help us track down server desync issues. If you experience such issues and are recording, please be sure to capture that screen and send it in! Added the new items that will be distributed for the upcoming Showdown. Numerous fixes and optimizations for Hosted Games and Spectate mode (which will be used for Royalty Showdown). Game Update - Improvements to Audio, Grenades, Movement, & More! Here's a detailed look at everything coming with this update! The newest update is coming to the Live servers on 2/5 at 7am PT. Downtime is expected to be 6 hours. In an effort to get back to the roots of H1Z1 we made the following improvements. Dodging enemy fire by sprinting and whipping your mouse around (ENAS) has become far too effective while creating extremely odd combat encounters. Therefore we have taken significant steps to address issues related to this by making adjustments to both the movement system and its values to improve gameplay and nerf ENAS. The details are provided below. Added functionality that slows player movement on rapid mouse input to combat ENAS. Reconfigured how player heading updates were being sent to remote clients, remote players will now be much more accurate in the direction they are facing. Slightly reduced base movement speed, however players now run a bit faster with fists out or while holding binoculars. Slightly reduced the bonus from all shoe types, the rarities are still in effect with conveys being the fastest shoes. The entire animation set has been adjusted and animations are less exaggerated. Elbows have been moved closer to the body to make the hitbox more consistent, particularly when peeking from cover. There is also less head bob throughout the animation set making sure the head hit box is moving as little as possible. Idle animations on remote players are now more subtle to reduce headshot/bodyshot on idle targets. The grenade system has been reworked to combat the use of rapidly throwing grenades and Molotov cocktails. To help retain their usefulness and expand the combat meta, we’ve added an additional inventory slot dedicated to Grenades. Additional utility and changes to values are listed below. Added a grenade slot, players will now only be able to equip one grenade at a time. The third weapon slot will remain a weapon slot. The grenade arc has been adjusted to draw over time. Players can still use the grenade arc, but they can no longer throw with instant precision. Grenade roll and bounce have been added again, the roll and bounce amount will depend on the angle/slope of the terrain. Gas grenades now ramp damage up over time, they do slightly less damage up front but are extremely lethal over time. The full screen blur effect has been removed from the gas grenade. Smoke grenades now extinguish the fire from a Molotov. This also applies to players who are on fire. If a Molotov is thrown into a smoke grenade it will not ignite. Frag grenades have had their kill area reduced significantly. Grenade sizes have all been increased slightly to make them easier to see when thrown. Grenade trails have been brightened slightly to make them easier to see when thrown. Grenades have had their cool downs significantly increased to reduce spam. The M9 damage has been slightly reduced; it now takes 2 shots to the head to kill, or 3 with a helmet. To reduce the early game of randomness, we’ve removed Laminated Armor (Lammies) from spawning in the world. Now you can only find them in the Air Drops. To help breed a bit more contention and make them a bit easier to get to, we’ve upped the number of airdrop crates that can spawn from the plane to three. In addition minor clean up and Quality of Life improvements have been made to the UI, Match Start Up times, and Safe zones. In the future look forward to different Plane Models to help differentiate between ones that drop Crates and the other that drops Bombs. Airdrops will now consist of up to 3 drops instead of 1. The smaller the safe zone, the fewer drops. Sniper rifle drop rate has been adjusted in order to maintain approximately the same number of sniper rifles in play per match. Airdrops now spawn flares when opened so other players know someone has interacted with the crate. Bombs will now center on the drop and will no longer seem to drop in random places. Bombs will no longer one shot a vehicle. Laminated armors no longer spawn in the world and can only be looted from airdrops. Item condition has been removed with the exception of armor and helmets. Increased the drag leniency to make it easier to left-click on a helmet to equip it. The safe zones have been adjusted and will now center on themselves slightly more from phase 3 and on. The city ending safe zones have been removed. Safe zones in general have been reworked to no longer end on buildings; but can still land between them if there is ample space (in a park in a residential area for example). Match start countdown is now 45 seconds (reduced from 90 seconds). Due to popular demand we’ve introduced the Sniper to the Combat Zone. Recognizing the power of the Sniper rifle we have it spawning in your third slot but only during the last five minutes of the Combat Zone. We have also removed most item spawns from the Combat Zone as they were not really used by players much and only reducing performance. Players now spawn with a different loadout for the last 5 minutes before the Combat Zone server restarts. This new loadout includes a sniper that will appear in slot 3. All loot with the exception of helmets and makeshift armor has been removed to increase performance. Additional spawn zones are now available in an effort to spread out population slightly. Increased the base characters carrying capacity by 200 in order to make room for the additional ammunition built into the loadouts. We’ve overhauled our in-game audio system to provide much more realistic and accurate directional sound effects. When you’re inside a building and hear gunshots, you’ll have a much easier time telling the difference between shots fired from inside that building versus shots fired from outside. Additionally, we recorded new gunshot sounds that are completely authentic to the guns in-game. Finally, the new system is also more efficient and is one of several small performance improvements in this update. We’ve streamlined the log in process by removing the DayBreak LaunchPad. Learn all the ins and outs of this new process here:. The LaunchPad is no longer part of the login flow for the game. Now, when you launch H1Z1 from Steam, you’ll be taken straight into the game client instead of having to go through the Daybreak LaunchPad. Upon first login, you will be asked to accept the EULA. Submitting a valid e-mail will grant you two crates that can be accessed in My Crates. In-game Settings, Map, and Inventory have all been updated to match the main menu style. The rest of the in-game UI will be updated along this style in a future update. Top 10 scores per mode once again show on mouse-over in the Play menu. Added a Render Scale option that allows a user to render at a higher resolution for better visuals. Please note that going over 100% will have a dramatic impact on performance. Adjusted the lighting and muzzle flashes for all weapons to make them more performant. Tuned point lights to muzzle flashes, Molotov’s, and frag grenades. Adjusted the lighting model for dynamic lights to reduce the fall off range and decrease their performance impact. Cleaned up player animations for pulling out a new weapon to address the issue where they would appear to be shooting before their weapon was equipped. Vehicles are now far less likely to immediately explode when wedged in between two objects. They will begin to take damage and eventually catch fire and blow up, however. Helmets no longer disappear when looted by a player with a full inventory while reloading. Explosive arrow damage now properly goes through chain link fences. AK-47 shot sound effects no longer sound muffled when fired from prone and aiming down sights. Also fixed shot sound effects not coming through one speaker side when fired while backed up against a wall. Impact effects no longer play when bullets pass through chain link fences. The emission sound effects for gas and smoke grenades no longer cuts out early. Other players nocked arrows no longer become invisible if the same arrow is nocked twice. The camera no longer clips through terrain when prone in first person. Pressing autorun while prone no longer causes the player to start standing then go back to prone. Sprint is no longer canceled when swapping cameras while sprint toggle is on. “-1 Teams” no longer displays in Solo Hosted Games. Other players now properly show shells ejecting when firing a shotgun. Fourth consecutive melee attack with a machete is no longer faster than other attacks. Fixed numerous minor bugs in The Arena such as clipping or floating objects. Fixed numerous loot distribution bugs in The Arena where certain areas or buildings did not contain the appropriate amount of loot. Changing a setting in the Main Menu no longer causes the in-game settings menu to appear blank. Team UI now displays the correct kill count while spectating a player that dies. Spectated players name no longer occasionally goes missing in Duos games. Starting a match while editing Settings no longer causes the Settings menu to appear distorted. Team Killer icon is no longer partially obscured in the Team HUD. Voice indicator now appears for users who are spectating. Exit Match button is back to its proper place at the bottom of the Team HUD while spectating. “Hide Compass” no longer also hides the map coordinates. Pressing “Left,” (default: A), wen backing up in first person with the SMG no longer causes the camera to turn instead of strafing. Items no longer appear stuck on screen when a dragged item is held while inventory is closed. End screens no longer incorrectly appear after closing the Player Report window before entering Team Spectate. End screens now show the proper amount of Skulls earned while a Boost is active. Cleaned up the character hand animations for moving and shooting while aiming down sights with a rifle. Players no longer appear to hold shotguns awkwardly after standing up from prone while reloading. Fixed numerous minor text issues in the UI, including cut-off text in several non-English languages. Test Server Update - Audio Improvements, Grenade Revamp, and More! Here's everything that just hit the Test Server. We've just published a new build to the NA/EU/Asia Test servers. Below is list of details about the changes that have been included. Please post any feedback about the changes, or bugs encountered, to this thread. The team will keeping a close eye. Only Solo mode and Combat Zone will be available. We plan to unlock team modes Monday (January 29th). We have done several changes and adjustments to both movement values and how the movement system works to improve gameplay and nerf ENAS. The details are provided below. Added functionality that slows player movement on rapid mouse input to combat ENAS. *We are keeping a close eye on player feedback and will be making adjustments while on Test. Slightly reduced base movement speed. The entire animation set has been adjusted and animations are less exaggerated. There is also less head bob throughout the animation set making sure the head hit box is moving as little as possible. Idle animations on remote players are now more subtle in an effort to reduce headshot/bodyshot on idle targets. The grenade system has been reworked to fight spam and add utility. In addition to this, some small changes have also been made to weapon damage. Supporting cough audio has been added to reinforce that damage is ramping for the gas grenade. The M9 damage has been slightly reduced, it now takes 2 shots to the head to kill, or 3 with a helmet. A series of changes have happened on the game play side of things as well. Airdrops, armor, and gas mechanics have all been updated. Outplay mechanics have been enabled, but please note, these are on Test for feedback purposes only and there is more work that needs to be done before they go Live. Drop-shotting has been enabled, as mentioned above this is one of the outplay mechanics that is not currently intended to go live but feedback is desired. A player can now swap seats while a vehicle is in motion. As mentioned above this is one of the outplay mechanics not currently intended to go live but feedback is desired. A feature has been added give a player a new loadout at spawn 5 minutes before the Combat Zone server restarts. This new loadout includes a sniper that will appear in slot 3. The LaunchPad is no longer part of the login flow for the game. Now, when you launch H1Z1 from Steam, you’ll be taken straight into the game client instead of having to go through the Daybreak LaunchPad. Upon first login, you will be asked to accept the EULA. Submitting a valid e-mail will grant you two crates that can be accessed in My Crates (note: only available on Live). In-game Settings, Map, and Inventory have all been updated to match the style on the front-end. The rest of the in-game UI will be updated along this style in a future update. Vehicles are now far less likely to immediately explode when wedged in between two objects. They will begin to take damage and eventually catch fire and blow up, however. What’s up everyone! We wanted to take a few moments to talk about an important topic amongst the players, streamers, and pros alike: ENAS. For those who may not know, ENAS (also known as the Eastern North American Strafe) is a method of movement that involves moving your mouse back and forth rapidly while running forward and strafing to make yourself extremely difficult to be shot by other players. We can give credit to the naming to CDNThe3rd and the technique has become so popular you can even find it in the Urban Dictionary. All that aside, it had a good run (pun intended), but it’s time for it to go. We understand it is a sensitive subject and we wanted to write this blog so we can give some insight and context on why we’ve decided to make the changes we are in order to nerf the mechanic. As mentioned above, the root of the issue is within the fact that other players become stupid hard to hit when they ENAS. When working through the solve for this issue, we wanted to make sure we had minimal impact on general movement in the game and we only wanted to adjust the feel of the game when someone attempts to ENAS. We discussed a few different options, so let’s go over some of the possible solutions to help you understand how we landed on our final decision. First up is animation-driven movement: this type of movement can be found in other games and is traditionally used in more immersive types of games like RPGs and not so much in games that have a faster pace. Animation-driven movement means that when you do something like change direction, your character has to animate from one direction to another so while the transition can look very good, the game feels sluggish and unresponsive if you’re trying to maintain a high level of speed and momentum. Another solution we looked at was allowing strafe input to affect your heading. So, rather than running forward while looking forward when strafing, your character would have a change in heading when running and strafing, causing them to look off to 45 degrees in either direction depending on which way they’re strafing. This can be problematic because it is a massive shift in movement and it impacts ALL movement in game, even when you aren’t trying to manipulate the system to make yourself harder to hit. Since it would have impacted H1Z1 on a global movement scale, we opted out of it. We finally went with a movement modifier on rapid mouse movement. When a player is navigating the world naturally, movement is unhindered and the pace and momentum are carried with direction change. This changes, however, when the game detects frantic mouse movement and it applies a modifier to the character's maximum run speed. The reduction of the speed results in the player now being much easier to hit and should be a hefty deterrent from a player trying to ENAS. On the design side we have many tuning values and variables that we can adjust to affect when the movement modifier comes into effect and how strong the penalty is. We have control over how quickly the penalty wears off and how much mouse movement is required for it to be applied again. We will be working with the community on the H1Z1 Test Server to tune and make sure we get this feeling as good as we can. There are also some other fixes that are going in that not only help make ENAS less efficient but improve the game overall when it comes to a combat standpoint. We have significantly improved the player heading update rate which means that when a player turns, you’ll see them turn on your screen at a much more accurate rate. This not only helps a player’s direction and animations become more readable and predictable but it solves a lot of issues based around incorrect player heading. One of the best examples we can think of is when you get killed by a shotgun and the other player didn’t even look like he was facing you, even though he was on his client. The other fix is to movement speed in general: we’ve decided to slightly lower it. Without going into complex details, the movement speed was increased for the Combat Update in August of 2017 to fix a different movement issue. However, the proper fix is now in place but the movement change was never reverted. One of the biggest positives of slightly slower movement is the reduction of warping and teleporting you see in a match. From time to time you may see a player running across the screen in front of you and they may warp or teleport slightly; this new change fixes that. So, in a nutshell we hope you have all found this to be insightful and that it provides the context required to understand why we did what we did. All of these changes will be pushed to Test as soon as next week (January 29th) and we’ll be working with you all to get feedback and make additional tuning to ensure this feature is solid before we push this bad boy to Live. What is up everyone! Today’s update touches all the guns in the game. We’ve brought back one of the most iconic game mechanics, fine-tuned the accuracy of the guns, and adjusted bullet drop and speed. There’s a lot to this update, but before we get into the details, we’d like to acknowledge and thank everyone from the Test Server and Focus Group who provided feedback to help us bring the best version of this update to life. One of the most notable additions from today’s update is horizontal recoil on the AR-15. As one of H1Z1’s most iconic game mechanics, it should feel quite familiar to those who have been around a while. Horizontal recoil keeps the firing pattern kicking left and right when you stay within the reset time. If you start to shoot wildly it will add additional vertical recoil. We’re excited to give newer players the ability to experience one of the mechanics that made H1Z1 a truly unique Battle Royale experience. H1Z1 is a competitive game and so we’ve gone back to our roots with this update and re-introduced some of the harder-to-master mechanics. First, we’ve slowed down projectiles and added more drop. This requires players to aim higher and lead further to compensate for movement. While testing this update, we closely monitored speed to determine how slow we could go while still maintaining a responsive feel. We’re confident where we landed and all the details of the change are bulleted down below. Second, we wanted to reduce the ability to spray with accuracy from medium to long distances. H1Z1 is about precision, not spamming and spraying. With this update we’ve increased mechanics like recoil growth over time in order to make spraying much more difficult. Now, a highly skilled player who takes the time to aim and tap in medium- to long-range fights will almost always win against someone who is spraying. Recoil Model: The recoil model for the AR-15 has changed and will now rely on pure horizontal recoil when the player is tapping. If the player begins to spray, vertical recoil will kick in to combat it. Head-shot Damage: Added 35 damage pass through on helmet, this will bring a player who was at full health down to 65 if they had a helmet on. This makes the weapon a 4 shot kill instead of a 5 shot. Body Damage: Decreased to 23 damage, down from 26 bringing it up to a 5 shot kill from a 4 shot kill. Head-shot Damage: Added 35 damage pass through on helmet, this will bring a player who was at full health down to 65 if they had a helmet on. Added a HUD element that denotes the difference between fire modes. Single bullet icon is Semi-auto, five bullets is full auto. The AK defaults to Full Auto mode when first picked up. Damage fall off has been increased to 25 meters from 10 meters to increase the forgiveness on range. Recoil has been reduced to make combat smoother with the shotgun. Holding breath with the Sniper Rifle now has an appropriate sound effect. You can also read the complete list of patch notes that include these weapon changes but also a host of bug fixes and other improvements. That’s about it for this update, but here’s a quick look at some features in the works that will be arriving on the Test server soon, including changes to animation, movement, throwables, and more. We are currently going through the entire animation set to make ours less exaggerated, which will help characters feel more anchored and rooted to the world. This will also allow for better combat flow, creating more satisfying and predictable combat when engaging targets at longer ranges. We will also be removing passive stance, which will make players feel like they are in more control of their character. We will be slowing things down a bit to help eliminate warping and teleporting. Much like the animation changes mentioned above, the movement changes will really help root combat. Running animations will also be adjusted to match the new movement speeds. Our goal is to make sure H1Z1 maintains its fast paced feel, but not to an extent that is it exploitable and gets in the way of how satisfying combat. We’ve got a couple different solutions internally that will be testing out and like everything else, you’ll be able to try them for yourselves when we push them to the Test Server. Throwing a grenade should be a choice in H1Z1, not a default action you do just because you have one. New mechanics will be going to Test quite soon to reinforce this idea, including the addition of outplay mechanics. We’ll also be increasing the skill required to use them by removing their spammability. We’re working on drop shots, jump shots, and seat swapping. Not a ton of details on those at this time, but we wanted to make sure you knew they are still coming. Again, thank you all so much for assisting with this update and providing the necessary feedback needed to bring H1Z1 back to its roots. We’re excited to continue making this game with you all. Weapon Tuning, horizontal recoil, Skull boosts and more! Servers are coming offline at 7AM PT (1/17) with an approximate downtime of 6 hours. For more detailed information on weapon tuning values, please read our latest Dev Blog from Lead Combat Designer, Tony "Carto" Morton (this will be made available when the game update hits Live). The recoil model has been changed and will now feature horizontal only recoil when tapping. If a user begins to spam, vertical recoil will kick in and combat spray. The recoil model for single fire mode has been changed to match the old recoil model of the last iteration of the AR-15. It will now have a shallow V pattern when tapping, direction of kick is still random. The refire and reset times have been reduced to match those of the AR-15. The above changes also helped smooth out recoil in full auto mode slightly increasing the guns usefulness when that fire mode is selected. SMG ammo clip has been increased to 30 bullets, up from 24. Greatly increased damage to vehicles from 3% per bullet to 8%. Magnums will be far more effective at disabling vehicles now. Magnum shoots slightly slower now, refire time from 420ms to 450ms. Much more initial sway when first Scoping in – Holding your Breath (default Shift) will steady this for a while. Decreased time to Scope. This makes the sniper feel snappier but with the sway changes, forces the shooter to work with a smaller window of opportunity to fire a shot. Weapons now spawn with a single ammo box instead of two. Total ammo spawned is unchanged. Added a small HUD element to show reload timer. Added icons to the HUD to show AK-47 fire mode (single shot versus full auto). Additional HUD optimizations for minor performance improvements. Players are now able to purchase 7-day boosts to increase the rate at which they can earn Skulls via Daily Challenges. Read all the details of this new system here. Fixed an issue with the recoil system that was allowing for variable recoil on the first shot. First shot recoil is now consistent as long as you wait for it to reset. Players will no longer go into a stuck state when healing through gas damage. Steam friends with special characters in their names should now display correctly. Fixed the issue causing the packet loss message to incorrectly display. Firing ranges for all arrow types is now consistent. Fixed jerky weapon movement when shooting the AK-47 in first person. Magnum damage to off-roaders is now consistent with other vehicles. Bullet visual and sound effects from other players are no longer delayed if shot immediately after throwing a grenade. Occasionally, the team HUD will be missing when in Fort Destiny. It re-appears when you enter the game. Occasionally, the reload timer bar does not function properly and stays full. This happens more frequently in Combat Zone than in other modes. In order to keep games starting quickly and to bring the player base together, we are going to bring both NA West and NA East together. When logging in you will see just one server for North America. The physical location of the server will remain on the East Coast, as we discovered after further investigation that creating a central server would lead to a degraded experience for players. We predict that this change will lead to players spending less time in Fort Destiny, and it will also improve the experience for South America and Europe players should they choose to play there. We will be closely monitoring this experimental decision to see how performance is impacted overall and will make adjustments as needed.